Will also produce a waterfall of colour in hanging baskets too! Wherever you plan them, you will have perfect displays from May until - October. Incredibly weather resistant in heat or wet periods. 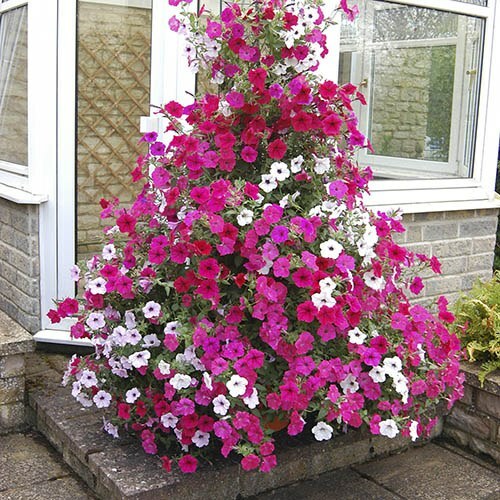 The best ever multi-purpose petunia that will romp across beds and borders providing brilliant 'Ground Cover', but will also produce a waterfall of colour in hanging baskets too! Wherever you plan them, you will have perfect displays from May until - October. Incredibly weather resistant in heat or wet periods. Height 45 cm (18'). Supplied as 24 Jumbo Plug Plants (2.5 - 3.5cm diameter). Flowers from late May until first frosts in the autumn. Not frost hardy so keep protected until the last frost. Pot on for 2-4 weeks before planting.